Happy 4th! I may be at work today, but I am definitely sneaking a little online window shopping too! 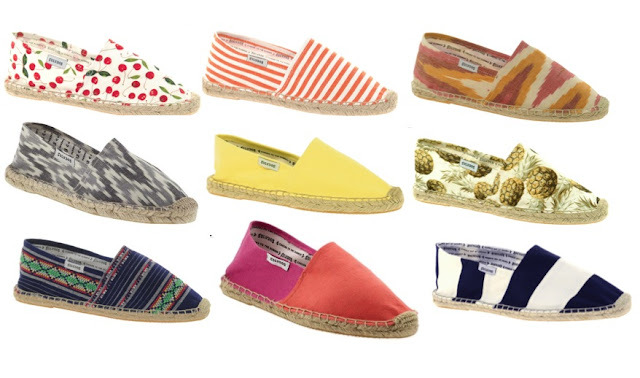 Currently on my mind is a chic pair of iconic espadrilles, Soludos style. From fresh stripes, and cheeky cherries to funky pineapples these shoes come in a myriad of styles, are fun on the eyes and friendly on the pocket book! Check it out! Oh no, I hope your day at work is going well. Sorry you don't get to have the day off! I love the blue and white stripe as well was the grey ikat. They're all such great finds!! Aw hope you are having a good time at work! Love the shoes! If you're bored at work check out my site so an extra 30 off of sales! I didn't know these had a special name! Makes sense, though. Great few you've picked out here, and your'e right, they're pretty affordable. I like the first vertical row, 3rd pair down. Pineapples are cute too, though! I love the cherries but would probably go with the grey ikat! Wondering if they are comfy...haven't known anyone that owns them. Please share your thoughts if you do get a pair! sorry you are at work!!!! I love the top two and then the middle one on the bottom! Love these shoes! They're such an easy thing to wear. Have you seen Sanuk's? They are awesome! Not espadrilles but a similar look..check 'um out!